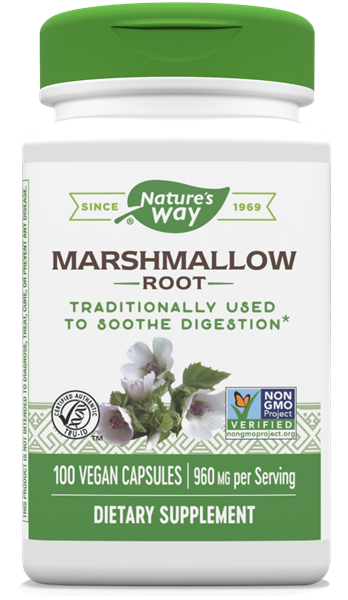 Marshmallow Root (COG) / 100 Caps - Nature's Way®. Marshmallow is native to Europe, western Asia, and the northeastern region of Northern Africa. It grows in uncultivated, sandy soil, often on the banks of rivers and marshes. At Nature’s Way®, we believe nature knows best. That’s why our mission is to seek out the best herbs the earth has to give. It’s the way we deliver uncompromising quality and help you live healthier. Take 2 capsules twice daily with food or water. If pregnant, nursing, or taking any medications, consult a healthcare professional before use.